How to open a profitable store in your city? Every day retailers all over the world face the same problem – where to open a new trade point? How to attract customers and make the store profitable? Geomarketing science – the direction of marketing at the junction of geography and classical marketing research helps to solve this issue. Most the largest retailers have been using geomarketing researches in their work for a long time. Geomarketing operates a huge set of various data – statistical and demographical indicators, pedestrian traffic data, mobile signals data, marketing information. Instantly, with any data which have geo-referencing. The presence of geo-referencing is the most important point for this type of researches, because it is necessary to analyze the spatial distribution of a number of factors. These factors may be: permanent population density, active population density, transport accessibility, competitors’ presence (both internal and external), income level, points of interests. All these parameters can be analyzed with GIS technology. However, entrepreneurs who wish to conduct a geomarketing analysis may face the following obstacles. 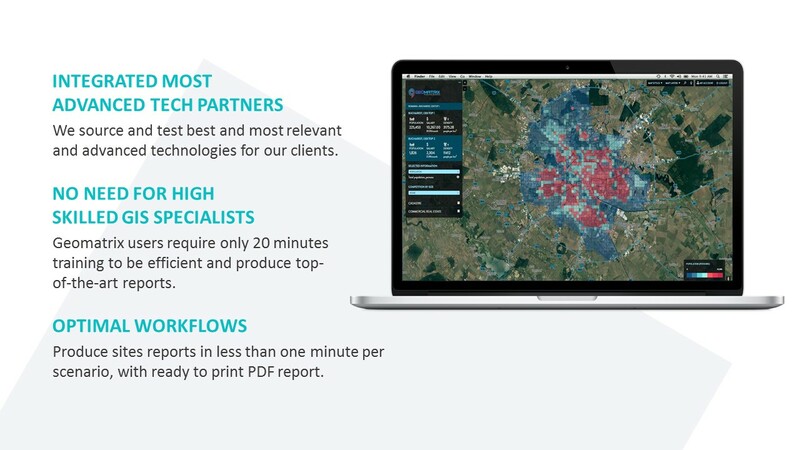 GIS technology requires the knowledge of specialized professional software. This means searching and hiring an experienced GIS expert or a GIS company, who will do the research. Of course, this is an additional cost for business. Is it possible to save time and money? Geomatrix uses only the latest official data from national statistical institutions. The main indicators are – population and average salaries at the lowest administrative level. 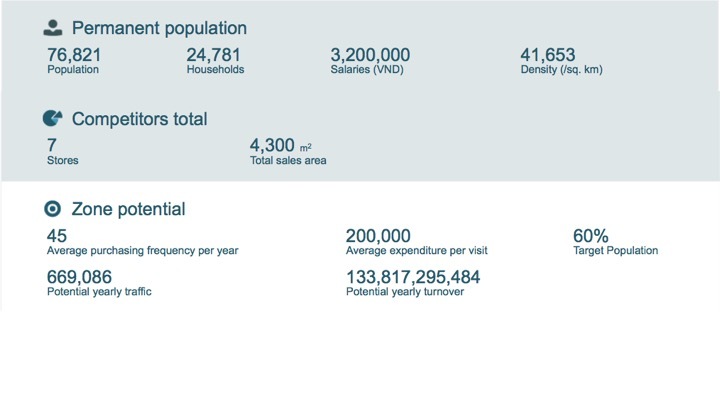 Population density are purchasing power on are calculated basing on the official statistical data. For the analysis of potential locations, in some cities with a large number of administrative areas (such as the Great London or the Great Paris with more than 5 000 administrative areas each) it is sufficient to use only national statistics, while in others it is preferable to use a more detailed analysis. 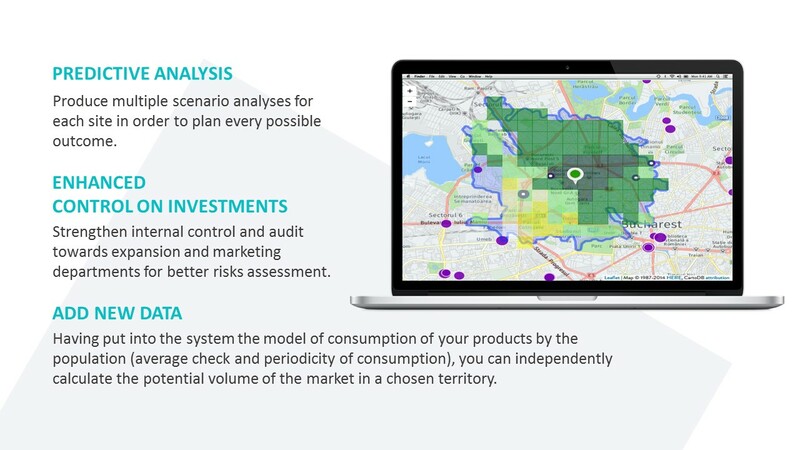 Therefore, Geomatrix also provides the analysis of micro-zones. 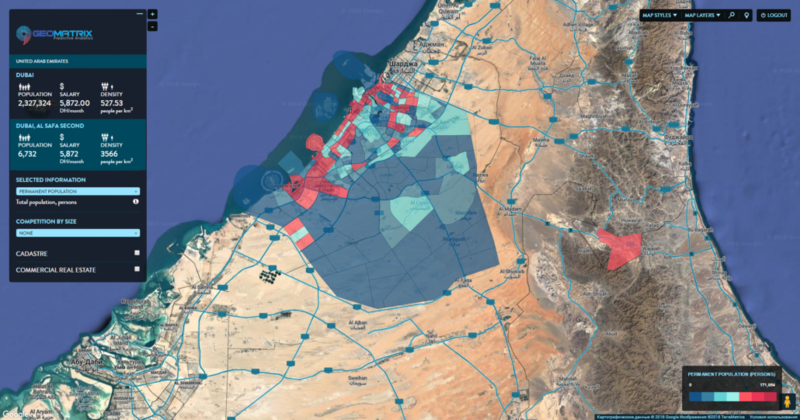 Micro-zones are the squares of territory, 400×400 meters, which allow geomarketing research to be performed with much more precision and accuracy. Micro-zones show the distribution of permanent population, the density of mobile devices geo-signals, the concentration of people around POIs. 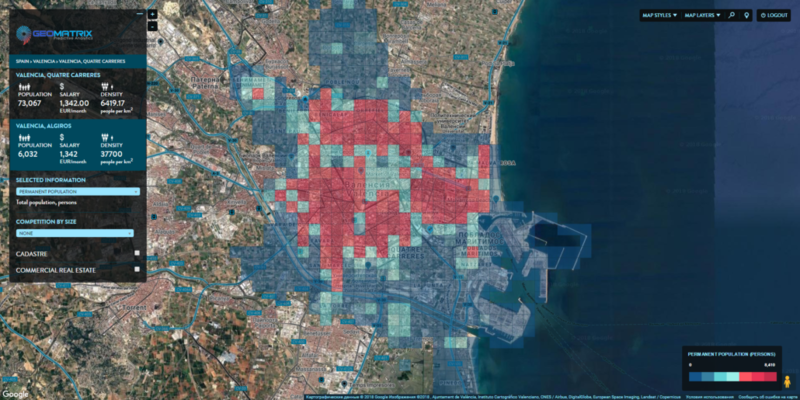 Micro-zones of Valencia, Spain. Distribution by permanent population. One of the most and newest interesting indicators is the density of mobile devices geo-signals. In each micro-zone we gather data about the number of geo-signals from mobile devices for a specific interval of time, in order to analyze the active population density in our micro-zones. Micro-zones of New York City. Distribution by the density of geo-signals from mobile devices. Micro-zones of Berlin. Distribution by the traffic sources (POIs). 3. 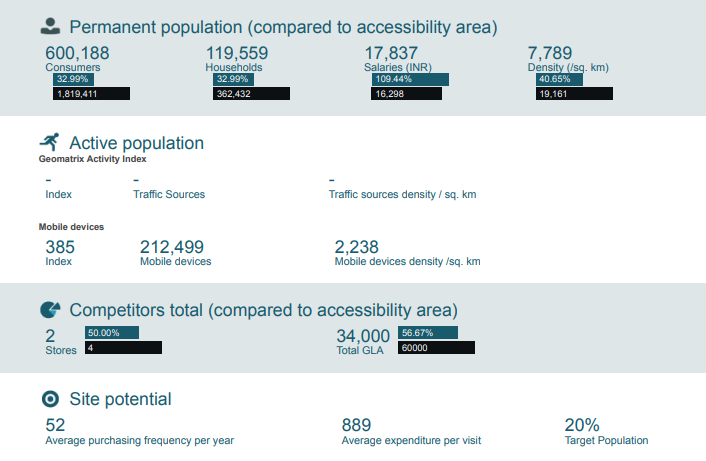 The Accessibility Area analysis – a Market size analysis. The size of the accessibility area is the key indicator when choosing a location for a new store. 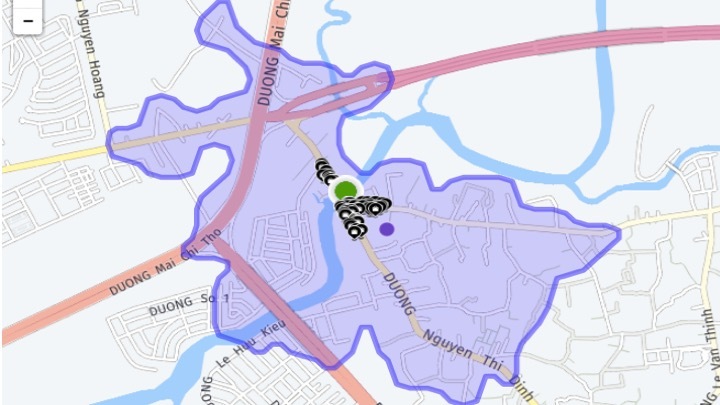 Let’s compare two different locations by addresses: 246 Bạch Đằng, Phường 24, Bình Thạnh, Hồ Chí Minh, Vietnam and 3 Cầu Giồng Ông Tố, Bình Trưng Tây, Quận 2, Hồ Chí Minh, Vietnam. Then we set the condition: limit the area to 20 minutes by foot. 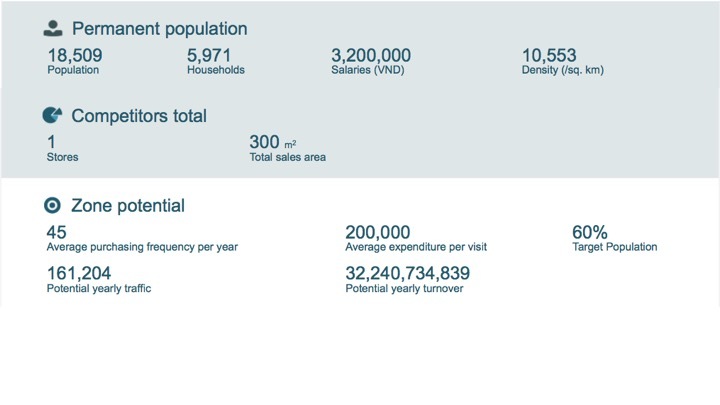 As a result, there were two suitable areas, which can be compared by the number of permanent population, by the presence of possible competitors and the expected annual turnover, which will eventually allow choosing the best potential location in few seconds. Finally we would recommend them to choose between those two locations the one at 246 Bạch Đằng, Phường 24, Bình Thạnh. 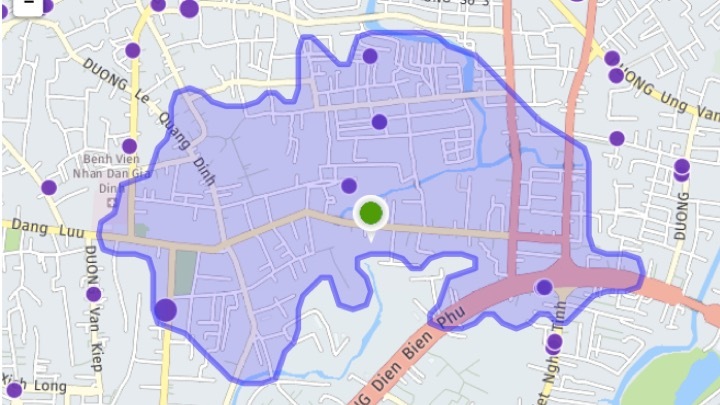 Despite the greater number of competitors compared to location 3 Cầu Giồng Ông Tố, Bình Trưng Tây, Quận 2, this zone wins by the number of potential customers. Accessibility area studies show very pertinent results in order to screen, rank, and select best options between several potential locations. Nevertheless, when arises the need to determinate the potential traffic and turnover of a retail outlet, more robust analytics should be used, such as catchment area analysis. 4. The Catchment Area analysis – commercial conception efficiency analysis. Light-blue coloured zone is the accessibility area. Within this area are operating competitors – they are shown as purple dots. Squares of green and yellow shades are the catchment area, which lies within the accessibility area. The greener a square is, the more suitable the zone is for opening a new trade point (is in the accessibility area; no competitors). Accordingly, the closer to competitor’s territory, the more yellow becomes the zone. If there are no squares, it means that this territory is occupied by other companies. 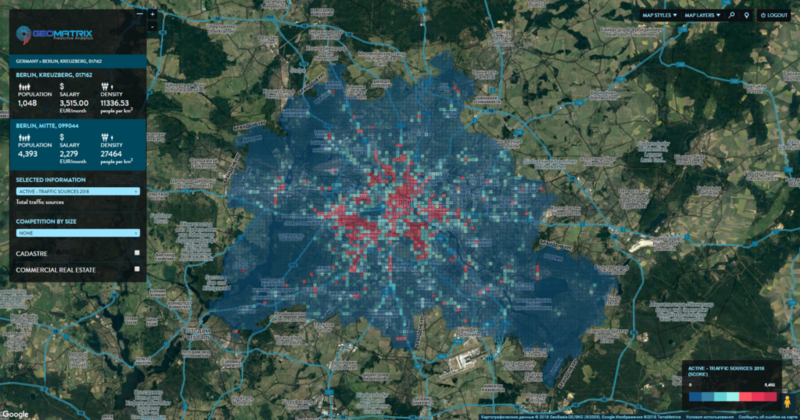 The system allows you to combine on one map data on the density of the permanent population with information about the location of shopping centers and their size. Even without creating additional reports, this makes it much easier to assess the location of objects. All trade points are divided into existing, under construction and projected objects. This allows us to see not only the current situation when assessing new objects, but also to predict the future. What’s more the system can be customized to your format and vision of the market. 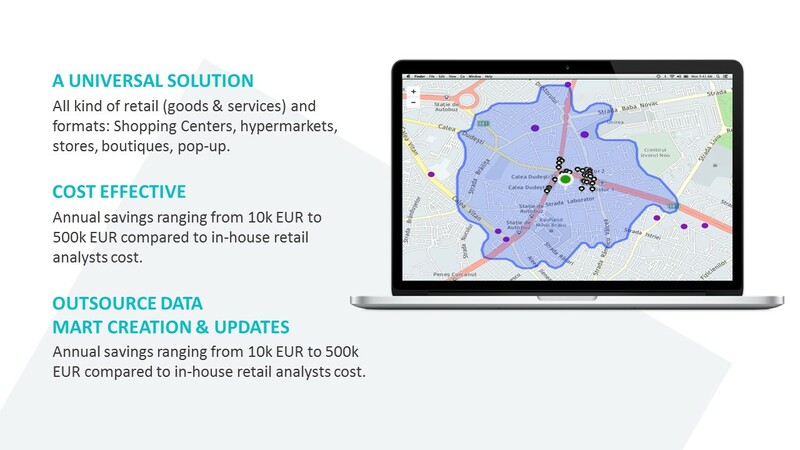 Finally, the assessment of project’s potential with the help of gravitational model allows you to get an accurate estimate of the effectiveness of location in relation to competitors and the forecast of potential turnover and attendance of supermarkets, hypermarkets, shopping centers, etc.